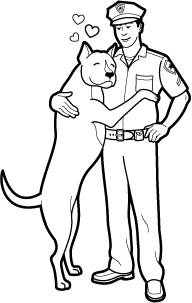 To illustrate the 367 dogs rescued in a recent animal cruelty case, the artist drew a pit bull dog and a police officer hugging….with hearts floating above them. Pit bull dogs are currently among the most popular pets in America, so it didn’t surprise me to see an image like this. 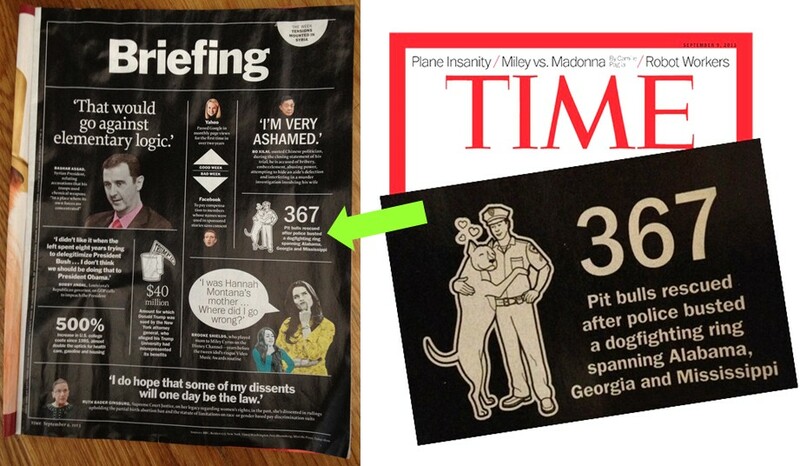 I viewed it as further proof (in a growing collection of evidence) of where things stand in 2013: pit bulls are dogs and America loves dogs. It’s no secret that pit bull dogs and their owners went through a dark period, falling out of favor with the general public. But that era is over and today we’re onto the next chapter, where pit bull dogs are popular family pets and the public is on our side. The past still exists, but it’s just that: the past. I tracked down the artist, Kate Francis of Brown Bird Design, to get the scoop on this illustration. Beyond Breed: What was the process for creating this image? Beyond Breed: Why did you draw this image, in particular, to represent the dog fighting story? Beyond Breed: So far we’ve been talking about dogs, in general. How do you think the public views pit bull dogs, like the one you drew? So there ya have it, folks. This wasn’t “propaganda” put forth by pit bull advocates, nor was it even created by a pit bull dog owner; it was an unbiased reflection of America’s love of dogs and the human-canine bond, as it exists in 2013. Pit bulls are dogs and they’re back in the circle of compassion where they belong. Though there will always be a small minority who doesn’t share the sentiment, progress like this speaks volumes. Usher it in and embrace it, the dogs are having their day! Supporting “at risk” dogs in under-served communities. Shout out to Kate Francis for her beautiful work and for sharing her time with me! Please check out her other illustrations at http://www.brownbirddesign.com. Kudos and thank you to the FBI, the United States Attorney’s Office, local police departments, HSUS, and the ASPCA for rescuing the 367 dogs. The dogs are now being cared for at locations around the country, receiving the medical care, love, and support they each deserve.